Not nearly as good as most people expected, though not without its strong points, Jurassic Park Interactive suffers from having an unfinished feel. Delays surely hurt the project, with it missing the 3DO consoles launch. Perhaps it was felt that any additional delays were unacceptable, and thus it was released despite not being quite 100%. It doesn’t feel anything like a beta, don’t get me wrong, but I can’t help but think more was planned for it. More mini games perhaps? (JPI is basically just a collection of short mini games) Or maybe, an actual ending? Anyway, JPI does have some strengths that help lift it up somewhat. 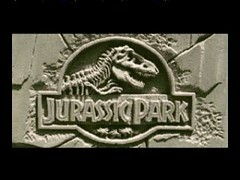 Featuring fine graphics, top notch audio, and actual clips from the blockbuster movie, JPI does manage to immerse you in the Jurassic Park universe. Of the three, the audio fares the best by far. This was one aspect of the game that was praised, even by the titles most harshest critics. The movie clips, though welcome and enjoyable, could have been so much more however. What’s missing? JPI does not feature any of the actual actors from the movie! Worse, the replacements look almost nothing like the people they are trying to portray. Sam Neill’s character, Dr. Grant looks more like Balki from Perfect Strangers, Jeff Goldblums Ian Malcom is more John Stamos, etc … Heck, Hammond and Nedry are played by the same actor, despite their characters probably being a good 25 years or more apart! It nearly yanks you out of the movie experience. Of the eight mini games that are included in JPI, five are more like sub games. Based on very early arcade coin ops, like Space Invaders, Asteroids, etc... these dinosaur themed clones are okay, but don’t excel in any real way. 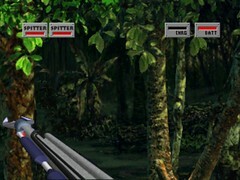 The shooting level has you using a tazer gun to target attacking spitters. Using the shift buttons, you can scroll to the left or right of the screen as you search them out. It is not a particularly hard portion of the game … unless you make careless mistakes. See, not all the dinos are attacking you. But if you accidentally hit a neutral one, you’ve made an enemy for life. Hit too many and that life will be short lived. Another thing to be aware of is that the spitters vary in size. Some of the tiny guys can’t be hit at the default height, so you need to adjust the aim of the gun. It isn’t especially compelling, but if you charge the gun up and have good aim it doesn’t take too long. The driving section was my initial favorite, as you flee in a jeep with a giant T-rex nipping at your heels. It was fun at first as I dodged roadside wreckage, heard the powerful roar of the huge beast, and saw him getting closer in the rear view mirror (stupidly placed in default at a screen blocking angle … thankfully adjustable) After a few plays though, I realized that it never really changed. The scenery, though good looking, was always the same, and the challenge didn’t seem to increase. Opportunity missed … sadly. The 3d maze sections (although I generally hate mazes) proved to be the best. It also has the distinction of being the scariest (if I can call it that) experience I’ve had with my 3DO. Trying to find my way out of a cramped building with raptors hunting me is tense enough, but it’s hearing the darn heartbeats that really get to me. The constant droning thumping that gradually picks up as they close in … by the time they are on top of you it sounds like a cardiac arrest is imminent. And the clip of the lunging raptor (though far too brief) harmonizes perfectly with the characters terrified scream. Yes, I find it even more intense than ‘Space Hulk’ in the scares department. This part of the game isn’t just a one trick pony either. Besides showing off 3DO’s talent for this genre, it also benefits by actually upping the challenge the further you get. The exit key gets harder to find, and the raptors even seem to get smarter at breaking out of the sections they’ve been enclosed in. 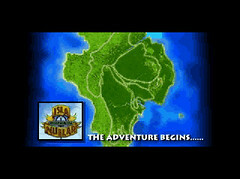 Perhaps recognizing that this was the most challenging part of the game, the manual includes some maps to help out. Very small, and I’ve never found them all that helpful, but still a decent gesture. A mixed bag, JPI is often viewed as a total failure. However, had this game not been base on a popular licence, I think the critics would have been a bit more forgiving. Perhaps it’s a measure of nostalgia talking (JPI was one of my first 3DO games) or maybe it’s because I really like the movie. I like to think though, that the games strong graphics and sounds, coupled with some varied mini games props it up to an average release. Enjoy it for what it is, not what it should have been, and play ‘Demolition Man’ for a movie/game translation done proper. Anyone else think this game is ok, despite its shortcomings? Very interesting and well-written review. I'm surprised there were no responses, especially considering it's one of the 3DO's more well-known titles. Martin III wrote: Very interesting and well-written review. I'm surprised there were no responses, especially considering it's one of the 3DO's more well-known titles. Thanks for the kind words. I admit I am probably in the minority when it comes to JP Interactive. It didn't live up to the hype and peoples expectations ... especially when other console versions played better. But the game does manage to hold a place in the more shallow and nostalgic corners of my gaming heart. this game kinda sums up a large portion of the 3do library. 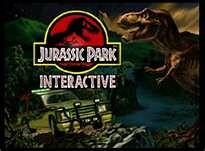 It has to be...the worst... Jurassic Park game. that's not saying it's a terrible game, but it doesnt even come close to the game gear game! I think most of the other JP games, even though they were varied, stuck to specific genres. The 3DO version though tried to juggle a several different game types, so they all kinda feel half baked. The idea could've worked (Demolition Man pulled it off pretty good) but for whatever reason it wasn't to be. Well written review indeed! And I gotta get this! I love dinosaurs and I love Jurassic Park! I dont care how bad it is. I remember drooling over the pics back in the day. Was the Raptor part scary like AvP on the Jag? I've never been that scared in a game before or since. One JP game I did not like was Operation Genesis on the PC. It was too much micromanagement. I wasn't able to enjoy it. On a sidenote about the actors. They do make odd choices. The Operation Genesis guy sounds nothing like Sam L Jackson. I worked with one black guy who sounded EXACTLY like Samuel L. Jackson. Thinking back now he was sitting on a goldmine in voice over acting for stuff like this. 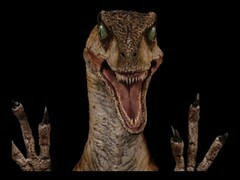 a31chris wrote: Was the Raptor part scary like AvP on the Jag? I've never been that scared in a game before or since. AVP was tense, especially when you heard a shriek behind you and there were 3 or 4 aliens charging! In JP the enemies aren't as numerous, but that actually contributes to the scare imo since you don't really have a chance to get too familiar with the threat. Plus unlike AVP you have no means to defend yourself. All you can do is run and hope you find your way out. Trapping only works for so long ... you are weaponless! Thanks for reading and for the comments. - I think the security minigames are definitely worse than "okay", and overall they cross the line into downright embarrassing. They'd be chintzy and substandard even if they were shareware, let alone as part of a triple-A package for a hyped new console. The worst is probably the fourth one, where you can win by simply spinning in a circle and shooting. The 3D Pong level is OK, I suppose. BTW how bizarre is it that, except for the Pong level, you have to commit suicide once you've earned enough points? If you play too long, you can miss your chance to warn the ship. - Ironically enough, on higher difficulty levels the driving stages (T-Rex Chase) end up being the hardest part of the game. On Normal they're a cakewalk, but on Advanced, they eventually (and rather suddenly) become unplayably difficult, as the T-Rex is right on your tail from the start, and you just don't have enough warning with some of the obstacles. - Agreed that the Raptor Maze levels are the best, though they're less complex than they seem and with practice you can breeze through them. Still, they have the most compelling graphics and gameplay in this package. - The Spitter Shoot levels are a cute idea, but get overly frustrating and cheap as the game goes on. Sometimes a spitter will be fully concealed behind a tree, yet is somehow still able to nail you. - Once you select a character's icon in the Security Tracking screen, there's no way to cancel and pick a different character. Since selecting a character is also the only way to see the names of the different sites and how they're connected, i.e. to plan a route, this is remarkably irritating! - Finally, as I posted here, the fact that you can't restore from a saved game without rebooting the game is basically unforgivable. If you want to force people to never "save-scum", then have the game autosave; otherwise, don't make me wait for 75-90 seconds of loading time (or more!) just to get back where I was. They could make the credits display every time you quit the game, but they couldn't just put a "quit back to main menu" option in the dialog boxes? Hell, even Alfred Hitchcock Presents let you go back to the menu with L+R+P, and that's probably the worst game ever made. The three raptor levels are all in a row, and the two levels that connect to the heliport are T-Rex (in the west) and Spitter (in the east). 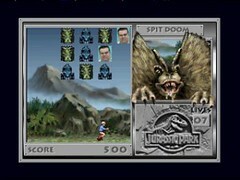 Since the T-Rex levels become almost impossible later in the game, you need to direct everyone to that SE spitter level, which is the Dock. Indeed, your first task should be to move everyone who's on a T-Rex spot onto a Raptor or Spitter location, and get all the driving over with immediately. By doing that, you'll knock those levels out while they're still easy. On my first attempt at beating Advanced I actually had to restart from scratch, as I'd directed everyone to the Main Gates. 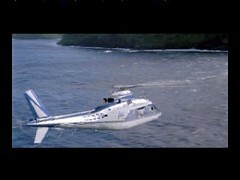 Ultimately, most people will leave via the sequence Visitor Center (or Hammond's House) > Raptor Pen > Dock > Heliport. The Garage also looks close but is less desirable, since it doesn't connect with the Visitor Center and forces you to take a roundabout route of Garage > Brachiosaur Pen 1 > Hammond's House (yes, those last two connect, despite being some distance from each other). Again, you want to avoid ever moving onto a T-Rex location at all costs. Don't waste time poking around on the main map, either -- at least until you've notified the ship -- as the clock is always ticking (much faster than real time). Once you've got everyone off the T-Rex locations, then tackle the Security levels. These are simple enough, and the only tricky bit is Level 5 ("Rap Attack"...sigh), where getting 20K points isn't enough -- you also have to cross over to the other side of the PCB, which you do by shutting down the fan (I think it happens around 10K points?) and then flying into that spot. The Spitter Shoot levels are straightforward; don't bother moving around a lot, and don't worry that much about shooting neutral spitters -- it's better to be aggressive and take shots, as the enemy fire rate is too high to reward precision play. That leaves the Raptor levels. As far as I can tell, the manual is fibbing when it claims that there are multiple raptors -- there's just one, and he can't be permanently trapped anywhere, though a closed door will delay him for a few seconds. Fortunately you run faster than he does! Usually the only place where I need to engage the Raptor inside the maze is Block 3. After I grab the key, I close the door behind me (without going back through it) and stand close to the door, inside the half-loop hallway. Be sure to hug the wall where the key is (on your right if you're facing the door), as I think there's a clipping error that occasionally lets the Raptor kill you if you're too close to the shared wall. Once the Raptor shows up at the door, back away a bit until he opens it, then go around the block (using the R trigger to save time), open the other door, and do an end-run around him. The other thing to remember is which way you should turn when you leave a block. If you've baited the Raptor, you'll generally know where he's coming from, and should turn away from him; otherwise, you can save time by turning in the direction of the next block you want to reach. Delaying by a couple seconds in the Raptor Maze can make the difference between avoiding him completely and getting caught, so get those patterns down! That said, there's no way around the tedium of shepherding 11 characters through the Raptor Mazes and Spitter Shoots. The latter, especially, can be very hit-and-miss, and sometimes feel downright unfair. But persevere, avoid the T-Rex squares, and never save/always reboot after losing a character, and you'll eventually make it. You should submit this post to the Game Guide section - very detailed!